The first team on this list is most likely place that Mariota will go on draft day. With their starting quarterback from a year ago retiring from the NFL and with an unproven guy like Zach Mettenberger as the only quarterback on the roster the team is in need of an improvement at the position and Mariota would be that guy. Learning Ken Whisenhunt’s system wouldn’t be as hard for Mariota as some experts think, considering Whisenhunt’s system is more of a pass happy type. The rumors around the Titans trading the second overall pick to other teams such as the Rams, Chargers, Bears, and Jets will probably continue to fill the media airwaves till Draft Day is upon us. One thing is for certain though if Mariota does go to the Titans at number two overall, expect him to be the starter going into week one of the season. Over the last couple of days trade rumors have emerged that San Diego would be willing to send Phillip Rivers and possibly one or two first round draft picks to Tennessee for the number two overall pick in a blockbuster trade that would send the NFL into shock. Whisenhunt was with the Chargers for the 2013 season, a season in which Rivers saw his passer-rating jump from 88.6 to 105.5, which happened to be the 4th best in the league that year. This is probably be the most intriguing place for Mariota to land because the Chargers are the best team that is considering drafting him, but Adam Schefter reported yesterday that it would probably cost the Chargers this years first round pick and next years first round pick along with Rivers to make the trade a reality. So the Chargers just have to ask themselves “Is Mariota going to be our guy?” and if that answer is a YES, than we could be seeing these jerseys all over Eugene and the San Diego area very soon. 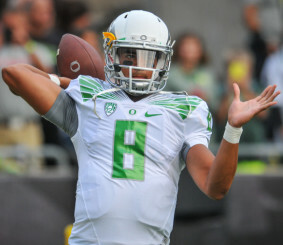 As a Duck fan how I could not be a little bit excited to possibly see a much anticipated reunion between Mariota and Chip Kelly? In the one season Kelly coached Mariota, he accounted for 38 touchdowns and over 3,000 total yards plus a trip to the Fiesta Bowl. 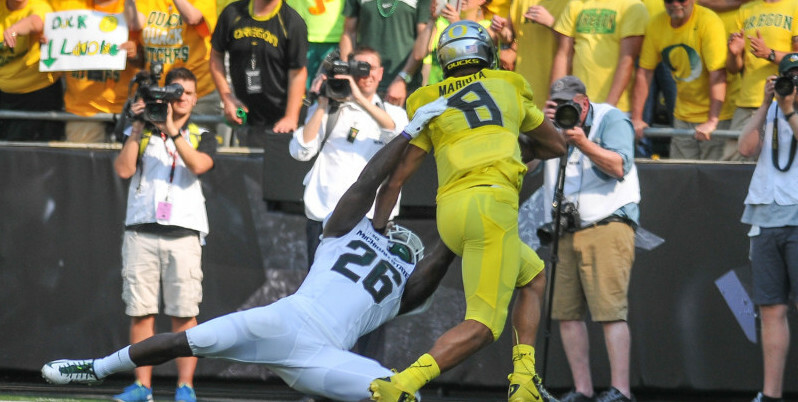 If there was a book called “How to use Marcus Mariota for Dummies” Chip would be the writer and editor of the book. So lets just all hope that on April 30th Chip uses that magic like he always does and lands the Quarterback of the Future.